Lithograph by J. Needham (fl.1850-1874) after Charles D.C. O'Brien, of 'Adam's Peak from the Ambogammoa Road at Pusbage', dated 1st January 1864. This print forms plate 5 of 'A series of fifteen Views of Ceylon illustrative of Sir J.E. 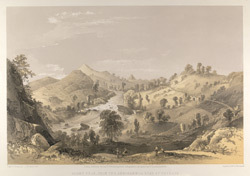 Tennent's work, from sketches made on the spot by Capt C. O'Brien, late Assistant Surveyor General, Ceylon' London, 1864. the text accompanying this image reads, "On the road from Gampola to Ambogammoa, the Mahavilla Ganga, which passes under a suspension bridge at the former town, here again bursts upon us, foaming down over a rocky bed, whilst 'The Peak', in which it has its source, cuts distinctly against the clear morning sky, though at about a distance of twenty-four miles in a direct line. On the right bank of the river, at this spot, is a flourishing coffee plantation, called 'Mahavilla', the property of Captain Graham, the talented architect of the bridge of Gampola. On the slope below the road are the terraced rice-fields, in forming which the natives show a wonderful ingenuity, industry, and tact in the conveyance of water, sometimes from considerable distances for their irrigation." The mountain of the Holy Footprint or Sri Pada, in the Ratnapura district, has been a place of pilgrimage for hundreds of years for Buddhists, Muslims and Hindus as it is believed that Buddha, Adam or Shiva left his footprint on the mountain-top.